As I did the previous two years, I flew rides in a club Cherokee for the public during the Williamson Flying Club's annual Apple Blossom Festival Fly-In Pancake Breakfast on May 22. My steed for 2016 was N701DT, a 160 horsepower Cherokee 140 that was completely new to me. My checkout on the day before the breakfast was brief. We flew some 60° steep turns to demonstrate that, indeed, the onboard g-meter indicated them to be 2g maneuvers. Who puts a g-meter in a Cherokee, anyway? Back over the Williamson-Sodus airport, Mike pulled the power and instructed me to put the airplane down on the runway's 1000 foot markers. I did and that concluded my checkout. Though I performed a few solo touch and go's with One Delta Tango in the rain after Mike moved on to his next appointment, I did not really develop much finesse with the airplane. This was apparent the next morning as I gave rides; every passenger who flew with me experienced a firm arrival. A week later, it felt good to be back at the controls of Warrior 481. Everything was in the right place, everything hummed correctly, and the airplane behaved exactly as I expected it to. I was en route to Akron Airport for their Memorial Day pancake breakfast. While in the landing flare on runway 25 at Akron Airport, I coaxed the yoke aft until the wheels rolled onto the pavement in a landing so good that it (mostly) erased my bad feelings over my (poor) performance at the controls of One Delta Tango. My only heartbreak of the morning was The Bear, who originally expressed interest in joining me only to decline when faced with the prospect of an early departure from the house. Fly-in breakfasts are always more fun when shared with other people, but there was no time to round up any friends. Nevertheless, I wanted to get some time in the airplane and Akron still made for a good destination, so I flew there solo. After breakfast, I roamed the ramp and looked at all the airplanes. This Navy SNJ advanced trainer belongs to the Buffalo Heritage Squadron of the Commemorative Air Force. Believe it or not, Akron hosts its own CAF organization! The data plaque on the engine of this beautiful warbird is stamped with the date: 6 December 1941, the day before Pearl Harbor was attacked by the Japanese. While most CAF units around the country seem to be called "wings", I assume this group uses "squadron" so as not to be known as the "Buffalo Wing". This would be inappropriately silly. How to tell when a photo was captured on an iPhone? Schmutz on the lens. This Stearman lives at the field and she's a beautiful specimen. I have not seen many orange Piper Cubs, but there it is. A beautiful 1953 Cessna 170. The Cessna 170 next to it had the words "The Older Woman" painted on the vertical fin. The Spam Cans were parked on the main ramp, including Warrior 481 at far right, though the Navion was relatively unusual and interesting. "Hot Pastrami" was among the collection of homebuilts on display. I could not help but wonder about the story behind the nose art. A close-up of the vertical stabilizer on another RV homebuilt. I just thought it was cool. I thought this American Champion Scout looked familiar. These were the first bushwheels The Bear ever saw. To say that I took the long way home would be an understatement, but I wanted to put more hours on the overhauled cylinder. From Akron, I flew southeast to Perry-Warsaw Airport, then overflew the falls at Letchworth before following a serpentine path dictated by terrain to Dansville (above and below). Seeking a smoother ride, I climbed VFR above the clouds and flew a (mostly) direct route back to Sodus. A turf equivalent to a Class Bravo airport? No, of course not. This is Bristol Mountain Ski Resort and those "runways" are a little steeper than anything I would care to use. I have not landed at Canandaigua many times, but the airport is noteworthy in that I have used it twice over the years as a alternate for bad weather. I suppose it makes a good port in a storm. It was good to see green across the landscape again. It was also good to be back in my airplane and feeling like I knew how to land with a level of finesse commensurate with the number of landings (about 2854) shown in my logbook. "The difference between general aviation flying and what I'm doing now is that, in GA, you get to make that go / no go decision. What I'm doing now? I'm goin'." Filing out of the Geva Theatre auditorium among other patrons, I found myself doing a sort of penguin waddle as the slow moving crowd limited my usual long gait. I suppressed an urge to "moo" as commentary. Working to avoid stepping on the diminutive octogenarian shuffling ahead of me, I almost failed to notice Ed in the crowd. I had not seen Ed in a couple of years. He bases his airplane at Le Roy and has come to my rescue at least twice in the past, once after we abandoned the Warrior in Pontiac and later when Darrell and I experienced the carburetor fire in Hudson, NY. He has since taken a post-retirement job with the airlines flying Dash 8s. I find this to be remarkable considering that he learned to fly a few years after I did. While discussing the differences between private and commercial flying, he focused on the dynamics of making go / no go decisions. For good or ill, as private pilots, the decision rests solely with the Pilot in Command. Not sure if the pilot or equipment are up to the task under the expected conditions of flight? Stay on the ground. In private aviation, there's no imperative to fly. In his new role flying revenue-generating flights, Ed has found that the expectation is to go unless he absolutely cannot. The final call still resides with the Pilot in Command, but the dynamics and expectations are different. Fortunately, the odds are stacked in favor of the airlines. Airline aircraft are generally more capable than our single engine piston ships and are less subject to the pressures and risks of single pilot operations. For those of us not flying under a commercial banner, for whom the burden of decision is owned completely, we strive -- and sometimes agonize -- to make good choices, particularly when flight planning reveals a lot more gray than black or white. Less than a week after my conversation with Ed, the forecast presented a lot of gray to assess in anticipation of a short trip to Boston. Against the background of my conversation with Ed came an opportunity. My friends Stacey and Ed C (a different Ed) had tickets to John Williams' Film Night with the Boston Pops in Boston's storied Symphony Hall. Unfortunately, life got in the way and they decided that a trip to Boston was a "no go" for them, so Kristy and I bought their tickets. I love orchestral film scores, an affection that began with the music John Williams composed for the Star Wars saga. When hand flying long cross country flights, I often listen to movie music from a playlist that contains, among other things, a lot of pieces from Star Wars. Personally, I find that listening to orchestral music makes the flight more enjoyable without distracting me from flying and radio-work in ways that vocal music often can. This was not just a wonderful opportunity to see an icon conduct some of his own beloved works. I had been seeking a good reason to land somewhere in Massachusetts and a trip to Boston seemed the perfect excuse to add that state to my map. First, I needed to decide where we would land. I ruled out Boston Logan almost right away. Though I have read about how one of the Flying Summers Brothers landed there in his single engine Diamond, I had no interest in dealing with the notoriously exorbitant fees from MassPort and, to be honest, there was a slight intimidation factor at play in my decision, too. MassPort fees further ruled out Hanscom Field west of Boston in Bedford. Those who judge such things on the Internet also deemed Beverly (north of Boston) as pricey and snobbish toward the single engine propeller crowd. 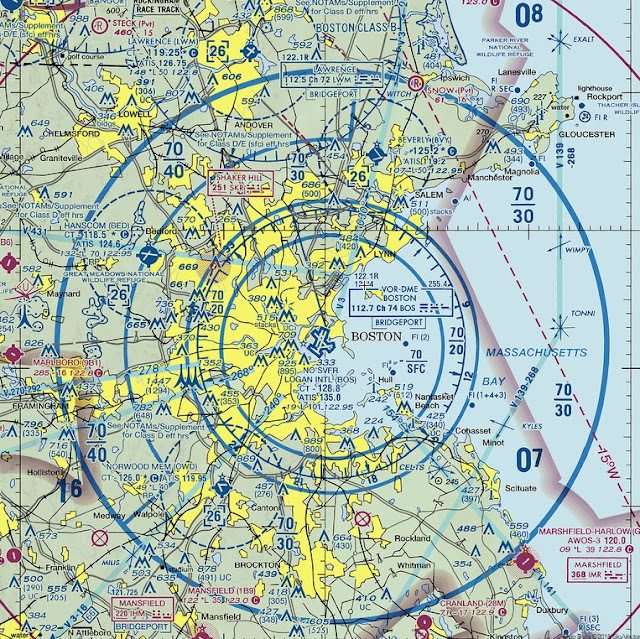 But Norwood Memorial Airport, located within 15 nautical miles southwest of the Boston VOR, is generally regarded as very friendly to general aviation. Ground transportation remains an ages-old conundrum for private aviators. How to complete those last few miles from the airport to the ultimate destination? Public transportation? Taxi? Rent a car, drive in an unfamiliar city, and pay overnight parking fees at the hotel? Public transportation does not always go where we want or need to be, a one-way taxi ride from Norwood to Boston reputedly costs $80, and renting a car sounded even less convenient. Given the significant presence of Uber in Boston, we decided to give it a try for the first time (with thanks to Ed C for showing us how it worked). In the days leading up to our Friday the 13th departure, I spent a lot of time scrutinizing the weather forecasts. A "go" decision was not a no-brainer. A low pressure area north of Rochester would pass eastbound and, extending southward from it, an associated cold front would sweep a line of wet weather across New York state. Depending on the timing, we would either depart Sodus during the frontal passage or in its wake only to overtake it on the way to Boston. Fortunately, risks of icing and convection were predicted to be virtually nonexistent (I hedge here - never say never). 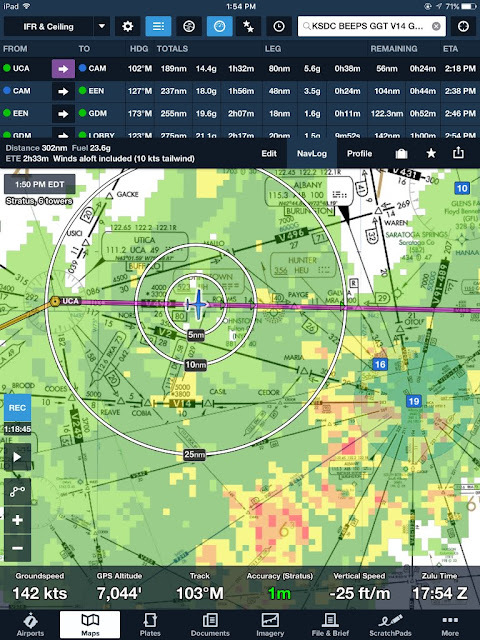 There was a chance for low ceilings and rain in Boston that would either require an instrument approach into Norwood Memorial or flying to a carefully chosen alternate. Ultimately, it was a "go", though it was not a go decision lightly made and I had contingencies on top of contingencies at the ready. I filed an airway route, hoping that flying airways would facilitate our passage through the congested airspace near Boston. 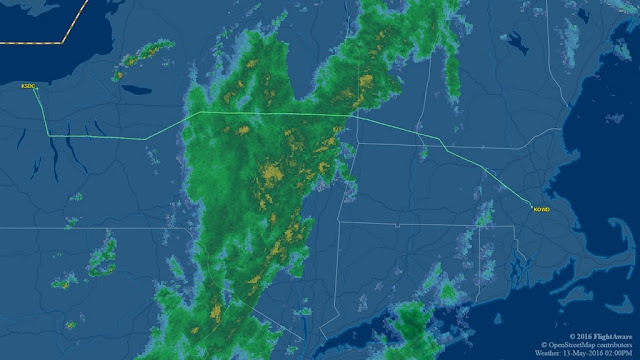 The most direct airway route on Victor 2 passed over the Syracuse VOR and would have conflicted with a VIP TFR in Syracuse that day (someone was "Biden" time at his alma mater). I refiled with: BEEPS GGT V14 GDM V431 SOSYO. This was accepted by the FAA computers. Kristy and I launched on what would be our first trip without The Bear in many years. Mom stayed with her while we were gone. The rain expected during our time of departure had already moved through Sodus, though we would soon overtake it. Aloft, I contacted Rochester for clearance, which was granted as filed. Within minutes of launch, we were climbing through a scattered layer at 3,000 feet on our way to BEEPS. I smiled as I thought back to the days of IFR practice with Darrell, who would react with jealousy whenever Rochester ATC cleared another aircraft to BEEPS. Darrell held an odd affection for that fix. We leveled at 7,000 feet prior to reaching BEEPS on the northwest corner of Seneca Lake. We made the turn onto Victor 14 toward Georgetown (GGT) and enjoyed a few minutes of beautiful sightseeing in the clear before catching up with the line of weather that had swept over Rochester that morning. Is it just me or does it look like that cloud is flexing? I-81 running south out of Syracuse was the last distinctive landmark we saw before we were swallowed by the weather. Kristy was already dozing by the time we entered the clouds. As we did, I heard those dreaded words from Syracuse Approach, "Warrior 481, I have a full route clearance for you. Advise when ready to copy." I slipped my pen from the loop at the edge of my kneeboard, took a deep breath, and told them that I was ready. "Warrior 481, you are cleared to Norwood Airport via direct Georgetown, Golf Golf Tango; Utica, Uniform Charlie Alpha; Victor four niner zero; Cambridge, Charle Alpha Mike; Keene, Kilo Echo Echo; Gardner, Golf Delta Mike; Victor four three one; LOBBY; direct." My handwritten notes had errors that the controller corrected in my readback. 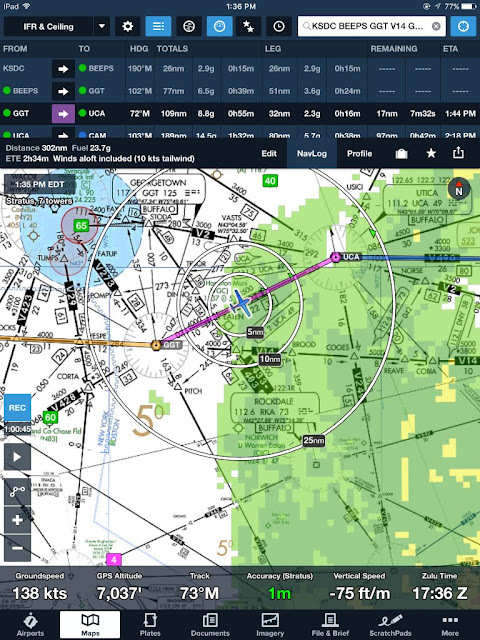 As Kristy dozed, I maintained Warrior 481 on course and altitude while I crosschecked the vertices defining the airways on the chart and modified the flight plan in the Garmin 430 to reflect the new routing. This endeavor kept me quite occupied for the remainder of Kristy's nap. Much to her irritation, she awoke just as we entered the rain west of Utica. She is not a fan of flying in the rain and we experienced a lot of it that afternoon. The view outside varied from a solid gray obscurity that pressed against our windows to occasional peeks at vistas beyond our own airframe. We were in zero visibility conditions more often than not. Sweeping over the ground at 140+ knots, we overtook the cold front near Albany. Coincident with our transition through the front, the rain intensity increased and we experienced some light chop. Our recently assigned route carried us north of the most intense rain versus what I had filed. I wondered if this was a simple coincidence or if the change in routing was Air Traffic Control intervening to help us avoid the most intense weather. Regardless of why our route changed, it worked out very well for us. Our world remained gloomy until we let down into the Boston area. Boston Approach provided a few re-routes -- mostly shortcuts -- before turning us direct to Norwood Memorial with an expectation for a visual approach to runway 17 in a gusty southerly wind. We landed in light rain. Someone from Flight Level Aviation promptly marshaled us to parking and waited patiently next to the airplane while we cleaned up the cabin and emerged from the Warrior. True to expectation, the folks at Flight Level Aviation were very friendly. We arranged for the Warrior's fuel to be topped-off ($4.96/gal), which carried an additional benefit of waiving the overnight parking fee ($12.00). Our ground track and goofy full-route clearance, as captured by FlightAware. From the lobby, I requested a ride to our hotel in Boston via the Uber app. Four minutes later, a Toyota Rav 4 arrived to carry us into the city. The driver was pleasant, the car was clean, and the fee was $30 (billed directly through the Uber app), less than half the expected cost of a one-way taxi ride into the city. It was all ridiculously easy and convenient. We chose to stay within a block of Symphony Hall at The Midtown Hotel. This anachronistic two story low rise was thoroughly unexciting, but it was clean, comfortable, and very convenient. A lobby decorated in a manner evocative of the 1950s perfectly matched the "architecture". It was a dated look in pristine condition. Noting that The Midtown had an attached beauty salon, Kristy dryly commented that people would probably emerge from it looking like cast members of Mad Men. "Hi! Is Mr. Williams home?" After dinner, we made our way to Symphony Hall. Built in 1900 for the Boston Symphony Orchestra, its acoustics were designed by an assistant professor of Physics at Harvard. Acoustically, it is considered the finest venue in the United States and among the top three in the world. The diversity of architectural styles near Symphony Hall was striking; from the Old World look of the Christian Science Plaza to the bland, but massive, Prudential tower nearby. The first half of the concert was conducted by Keith Lockhart, the current director of the Boston Pops who humbly noted that he was just a "warm up" for John Williams. Lockhart conducted performances of the Ben-Hur theme, the theme from Out of Africa, and the entire beginning of Star Trek: Out of Darkness in perfect synchronization with the film itself. Commenting that it was unfair for John Williams to be the only one to conduct Williams' compositions, Lockhart and the Pops launched into a medley of pieces from the Harry Potter and Raiders of the Lost Ark movies. When John Williams took his place at the podium, the auditorium went absolutely crazy with an adulation bordering on annoying. Williams was frequently interrupted by cheering and applause, waving gently at the crowd to calm down so that he could continue speaking. I often found myself wishing that the audience would just let the poor man talk. Williams was charming and clever, though he occasionally misspoke. Given his age (he's 84) and his contributions to his craft, those moments are easily overlooked. The set Williams conducted was all drawn from Star Wars repertoire, a mixture of old and new. He introduced his leitmotif for Princess Leia by explaining that he wrote it as a love theme for her and Luke. He expressed his chagrin over the day George Lucas pulled him aside after Star Wars was released and explained that the two characters were actually siblings. "So," he said, bemusedly, "Here's the brother-sister love theme." The distinguished composer also explained that he was quite infatuated with Rey / Daisy Ridley, using the names interchangeably in a way that made it unclear if his affection was for the character or the actress. He explained that he had not yet decided if he wanted to score Episode Eight, but that he did not want anyone else writing music for her. When the set was over and the audience rose to their feet, I enthusiastically joined them; not because it had been a fantastic performance (though it was), but because it was the only opportunity that I will ever have to express my appreciation to the man who composed an essential portion of my life's soundtrack. Williams knows how to work a crowd. He left the stage and returned for encores three times. For the first encore, he conducted the beautiful theme he wrote for Yoda. Next, it was "The Imperial March". This so excited the group of guys sitting next to us that they all stopped playing on Facebook for the first time during the entire concert (don't get me started on the boorish behavior of this audience with their "smart" phones). His final encore was a performance of music from E.T. When he returned to the podium a fourth time to thunderous applause, he mimed laying down to sleep, waved kindly to the standing crowd, and departed for the night. Though the crowd tried to draw him back through noise and force of will, the distinguished composer had set his limit. Our goal was to see some of the sights in Boston on Saturday before flying home to Rochester, but the weather picture demanded making a different choice. A system moving into Rochester that afternoon was predicted to create strong, gusty crosswinds and bore the potential for thunderstorms. We made the decision to depart after breakfast, taking some comfort in the knowledge that the combination of flying into Norwood and using Uber would make future access to Boston relatively easy. It was not easy to embrace a morning departure; the weather in Boston was spectacular and there was so much we could have done. Like a repeating motif in an orchestral score, the Pilot in Command always bears sole responsibility for the burden of prudent flight decisions. On the way to breakfast, we finally had a moment to study Symphony Hall without being rained upon. After breakfast, we requested an Uber ride back to Norwood Memorial. The car arrived within three minutes of our request and we were delivered directly to the door to the FBO. To say that our experience with Uber in Boston was phenomenal would be a tremendous understatement. Our total ground transportation costs added up to $60. I filed a GPS-direct route home thinking that the direct route would take us out away from Boston's busy airspace and simplify things for the approach controllers. Evidently, I was wrong. We were given a full route clearance starting with vectors to Manchester, NH that would take us through a significant swath of the Bravo airspace from south to north. At the end of the route, our clearance required us to fly past home base to Rochester before making a sharp turn east again to Sodus. I decided to straighten this out with a later approach controller because it would extend our flight time an unnecessary 30 - 40 minutes as we tried to reach home before the lousy weather hit. We were vectored along a meandering course through the Bravo as Boston Approach turned us this way and that. Before reaching the Manchester VOR, we were given a vector and told to intercept Victor 490, which I did using the signal from the Manchester VOR just for old times' sake. We flirted with the clouds on the way home, but largely stayed out of them. At one point, we were turned off Victor 490 for a potential traffic conflict. The controller offered to let us continue to our next waypoint directly, but terrain necessitated a climb to 8,000 feet. If we wanted to remain at 6,000 feet, he was willing to offer a vector back to the airway. Given the increased headwind at higher altitude, I chose the vector back to V490 via STRUM intersection. A minor decision, but one of many that occurs between take off and landing on any general aviation flight. Near the Deerfield Valley Airport in West Dover, Vermont. Clouds and turbulence increased between Albany and Syracuse. We had obviously entered the area of turbulence forecast via AIRMET. We were still far from Williamson-Sodus, but I grew curious about the state of the weather there. I opened the squelch on the radio to receive the faint weather broadcast and was dismayed to hear that the wind was out of the south (a direct crosswind) and gusting. I began formulating a Plan B (but in the end, did not need to use it). 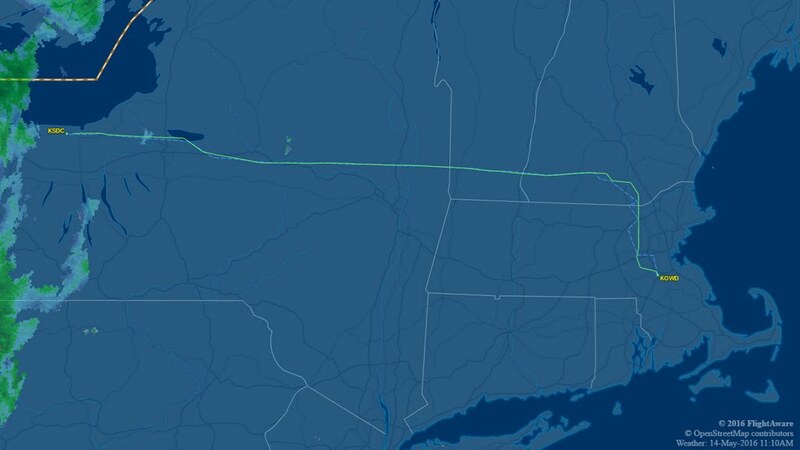 No longer over the high terrain of Vermont, I requested a lower altitude from Syracuse to keep us out of the clouds and to minimize the headwind. We only logged 0.5 hours in the clouds on the return flight versus the two hours logged en route to Boston. Syracuse granted that, then came back with, "Do you really want to go all the way to Rochester, then back to Sodus?" I chuckled. I love it when I don't even have to ask. "No, we'd rather go direct Sodus." "You got it," Syracuse responded. "Fly heading 310 and expect direct Sodus in a few minutes." I took the opportunity to have Kristy advance the flight plan in the Garmin 430W as a means of introducing her to the navigator's unique brand of user interface logic. Below the clouds, we were in good VFR conditions and the weather broadcast from Sodus indicated VFR conditions in light rain prevailing there. I could see Sodus Bay in the distance. I made the mistake of relaxing while planning to fly a visual approach into home base. The only question was when to cancel IFR. I decided to wait until being passed to Rochester and getting a visual on the airport. It is fortunate that I waited. In the distance, a gauzy curtain hung from the overcast to the ground; a line of rain. It did not look so menacing from a distance, but then I abruptly lost visual contact with Sodus Bay. A few moments later, our windscreen was streaked with rain and, suddenly, we entered a region of mist with zero visibility. At that moment, Syracuse transferred us to Rochester. I checked in with Rochester, appreciating the sound of the controller's familiar voice, and requested the RNAV-28 approach into Sodus. While transmitting, I quickly programmed the Garmin 430W for the approach and brought up the procedure in ForeFlight. Rochester assigned a vector to intercept the final approach course and descended us to 2,500 feet. We intercepted the final approach course crisply and flew on toward Sodus with the needle centered. Peering out the windscreen from just outside the final approach fix, I could not find the airport. I stayed on the gauges, crossed the final approach fix, intercepted the GPS-derived glideslope, threw in the first notch of flaps, and slowed the airplane to 90 knots. Despite the rushed set-up of the approach, I flew it well with localizer and glideslope needles forming a perfect cross at the center of the CDI. As we flew on, details from the outside world began to emerge through the mist and rain, but it all looked wrong. Where was the airport? I brought the new LED runway lighting on full, hoping that this would help. It was actually Kristy who spotted the airport first, largely because of her perspective from the right seat. The southerly wind was so strong that we were crabbed significantly southward to track the localizer. From my perspective, the airport was actually hidden behind the compass mounted to the windscreen's center post. Since our initial receipt of the weather at Williamson-Sodus, the surface wind had died to almost nothing and we made a facile landing on the wet runway. By the time we returned to our house from the airport, the trees in our yard swayed and groaned under assault from the wind, validating the choice to fly home that morning instead of waiting. predicting the course vectors that Boston Approach assigned us in departing KOWD. This was a short, but meaningful trip. It was great to have a date night out with Kristy in Boston and we thoroughly enjoyed the concert. It was our first landing in Massachusetts and served as an ideal opportunity to experiment with Uber. The process of flying into Norwood Memorial and using Uber for ground transportation yielded such easy, inexpensive access to downtown Boston that I am certain more trips will follow. Most importantly, the experience served to emphasize the recurring theme of judicious flight planning and the Pilot in Comand's authority to make go / no go decisions, just as Ed and I discussed during our chance encounter at Geva Theatre.